Pubic Symphysis Separation or SPD (Symphysis Pubis Dysfunction) - Pamela Morrison Pelvic Pain Physical Therapist, P.C. Pubic Symphysis Separation or SPD (Symphysis Pubis Dysfunction) - Pamela Morrison Pelvic Pain Physical Therapist, P.C. SPD (Symphysis Pubis Dysfunction) is sometimes used in literature to describe pain in the pubic symphysis associated with pregnancy and postpartum. In physical therapy or orthopedics this is referred to as Pubic Symphysis Dysfunction. Types of Pubic Symphysis Dysfunction can include osteitis pubis, pubic separation, pubic diastasis, or pubic misalignment. A pubic symphysis separation or diastasis symphysis pubis is the separation of the pubic bones. The pubic symphysis joint is comprised of the 2 pubic bones and a cartilage disc that sits in between the two pubic bones. With a separation or diastasis, the pubic joint dislocates without a fracture. The causes of this separation can be due to the pressure and hormonal changes of pregnancy, trauma from childbirth, falls, motor vehicle accidents, sports injuries, or horseback riding incidents. During pregnancy, a hormone called relaxin causes the ligaments joining the pubic symphysis to soften. The body is preparing the joint to have increased range of motion and flexibility for ease of labor and delivery. However, this may cause the pregnant woman to feel sensitivity or pain in the pubic joint. The pubic symphysis separates to a certain degree normally during delivery however, in some women this separation becomes excessive causing trauma and pain at the joint. Also, sometimes during delivery forceps use and/or a rapid birth can be a cause of the pubic separation. A gap greater than 4-5 mm is considered normal during pregnancy and can increase up to 9 mm. An X-ray can confirm a pubic symphysis separation. 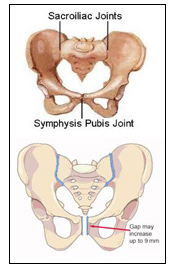 A pubic symphysis separation can cause difficulty ambulating or taking care of your newborn. Daily chores, lifting, separating the legs, and rolling over in bed can be challenging. The bones of the pubic symphysis can remain malaligned and painful unless treated by a skilled physical therapist. How can Pamela Morrison Physical Therapy help with pubic symphysis separation? After a comprehensive pelvic evaluation, a pubic symphysis separation and malalignment can be identified. Our physical therapists perform gentle, effective joint mobilization and realalignment techniques to the pelvic joints including the pubic symphysis and sacroiliac joints. Modalities for pain are provided such as ice, electrical stimulation, ultrasound, cold laser, and TENS (transcutaneous electrical nerve stimulation). Soft tissue mobilization to the surrounding musculature, ligaments, and tendons is provided. Support belts and ambulation assistive devices are provided as indicated. We also prescribe progressive strengthening exercises to create stability around the pubic joint. Proper body mechanics for activities of daily living and improved postural awareness instructions to prevent further injury are provided. Whether this problem is acute or occurred many years ago we have had excellent results treating this disorder and our patients have been able to return to a painfree functional status. Our post partum patients have gone on to have future successful vaginal deliveries without reoccurrence.